Is holiness a Lenten obligation? In the liturgical rite for Ash Wednesday, the priest stands up before the people and invites them “to the observance of a holy Lent.” It is a solemn and noble custom. But is it a serious proposal? And if so, what is actually being asked of the faithful? When people hear the word “holy,” they often think “devout” or “virtuous,” but qodesh, the word for holiness in the Hebrew Bible, is not a moral or behavioral term. It means “apartness,” conveying an inherent, critical difference between what is holy and what is not. The word itself is set apart. Unlike other divine attributes like power, justice and love, holiness has no analogue in the everyday life of Israel. It doesn’t refer to a common experience and then say God is like that. Instead, it evokes the one quality of God which is unlike anything we know. In ancient Judaism, holiness meant the radical otherness of God, the Holy One. The divine presence is not to be approached easily or casually, either by our bodies or by our language. God dwells in a sacred zone which is highly charged, difficult and risky to enter. Israel’s worship practices grew up around this strict sense of separation. At the center of cultic life was a holy of holies, a space set apart from contamination by the world. And only priests, who were themselves set apart and highly trained in the intricacies of access, were allowed to have contact with this sacred center. There was a sense that if the sphere of holiness were to be contaminated or carelessly regarded, the presence of the Holy One might withdraw from Israel, and that would be disastrous. Leviticus, not a book I spend a lot of time with, contains a long section known as the Holiness Code because of its repeated use of holy and holiness, as well as related terms like sanctify, hallow, consecrate, dedicate, and sacred. It is filled with detailed prescriptions ranging from ritual practice to sexual behavior. Many of these seem archaic and largely inapplicable today. But may we still find something valid in the impulse to preserve the “holy” from profanation or inattention? The sacred is made present by the attention we give to it. For example, if you come to a labyrinth occupying an open space, do you just walk straight across it, or do you go around it, acknowledging it as a space set apart for prayerful activity? Or does it only become holy space when it is put to its intended use, rather than just lying there as a decorative floor pattern? I once led a weeklong family retreat for a Nevada parish on the eastern shore of Lake Tahoe. There was a beautiful stone church, with a large window looking across the water to the high peaks of the Sierra mountains. The space around the altar was large enough to hold all of us, so we did most of our worship there, in the intimacy of a circle. I asked everyone to do two things each time they came inside the altar rails. 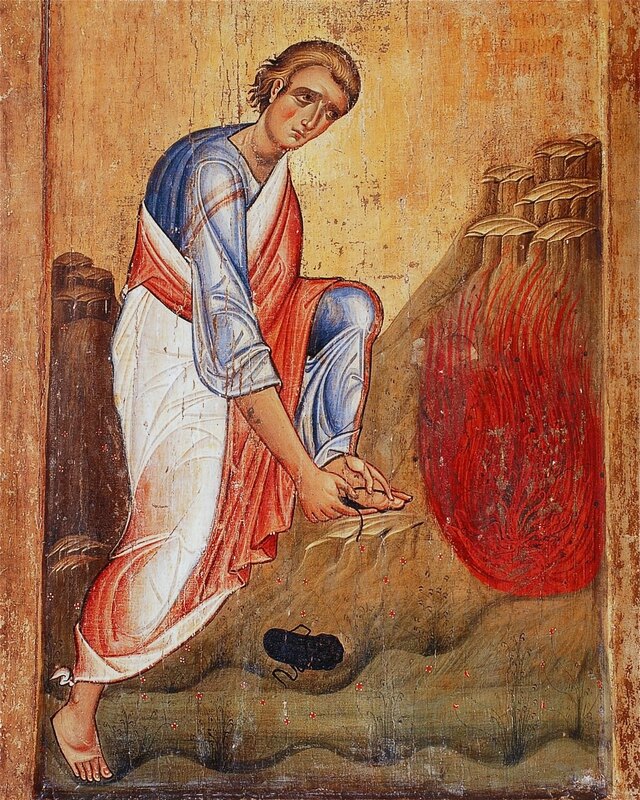 One was to remove their shoes, like Moses at the Burning Bush. The other was to perform an action of their choice to mark their entrance into holy space: they could lift their hands in prayer, bow, genuflect, cross themselves, kiss the altar, or prostrate themselves on the floor. Most of the children, being the enthusiastically embodied creatures they are, opted for prostration! The effect of these physical observances was tangible. The attention we gave changed the quality of being there. It became for us holy ground. But what Leviticus is after, and what a holy Lent is about, is more than the quality of a space or the attention we pay to it. Holiness is meant to be something contagious, something which gets inside us and changes us forever. As biblical people gradually figured out, hosting divine holiness means more than maintaining ritual purity or devotional piety. It means embodying justice and peace as well, uncontaminated by the dehumanizing, violent and oppressive practices of the dominant culture. Such holiness requires the consecration and dedication of every aspect of life to the will and purpose of God. The nice thing about such a list is that these are all things we can do. They are not perfections only achievable in a messianic future. We can perform them right now. Jesus offered a similar list. Is somebody hungry? Feed them. Is anybody thirsty? Get them some water. And if curing the sick or setting the prisoner free seems beyond you, surely you can at least visit them. This is not impossible stuff. Holiness, an attribute of God, becomes for us a practice. Not something we are, but something we do. Of course the specific obligations of holiness are not always clear. It is one thing to separate yourself by going to the desert, the monastery, or a countercultural refuge. It is quite another to live in contemporary society with its inevitable complicity in the evils by which the system maintains itself: militarism, consumerism, economic injustice and violence against the planet. How do we say no to the evil and yes to the good in a world of such complex interdependence? And yet, Scripture remains insistent that we continue to strive for sanctification, dedicating our lives to God and separating ourselves from whatever is not of God. Surrender. Is this too much to ask? Is a holy life too much to ask? Does it set the bar so high that we just abandon the field to an elite corps of ethical heroes: the few, the proud, the saints? But where do we begin? 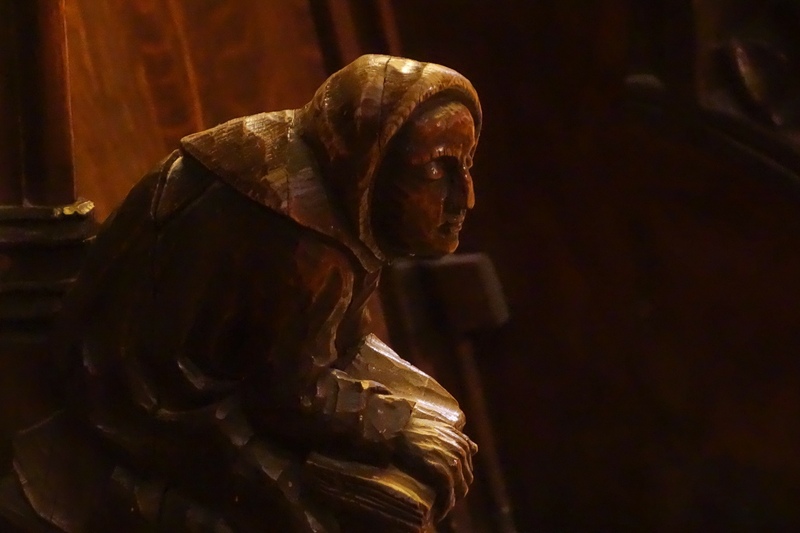 Thomas Aquinas outlined three stages of holiness: First, distance yourself from sin and wrong inclinations (holiness as an act of separation, turning your back on sin and turning toward God). Second, work on cultivating the virtues in your life (holiness as a daily practice). Finally, rest in loving union with God (holiness as communion with the Holy One). What do I need to acquire and cultivate? In whose reality do I want to dwell? And it’s never done, this holiness business. It’s an open-ended process of continual striving. 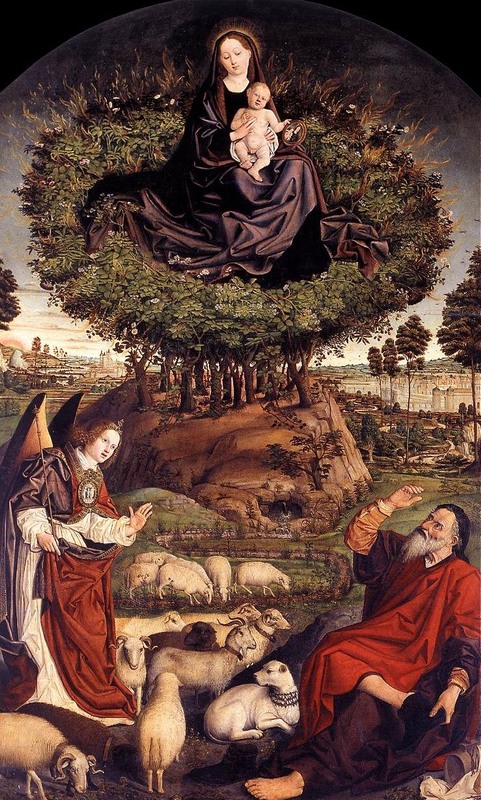 Gregory of Nyssa said, “The perfection of human nature consists perhaps in its very growth in goodness.”[iv] In other words, holiness isn’t something we achieve, it’s a commitment to growth. What if, every day during Lent, each of us were to make such a prayer? Here I offer and present to you, O God, my ________. Just fill in the blank with whatever the time and place requires. [v] Thomas Cranmer, Book of Common Prayer (1549), based on Romans 12:1, in the Episcopal Book of Common Prayer (1979), 336. There is a really deep well inside me. And in it dwells God. Sometimes I am there too. But more often stones and grit block the well, and God is buried beneath. Then he must be dug out again. Hillesum’s evocative image expresses the duality of the Lenten season. On the one hand, God is not the end product of spiritual attainment, something brought closer through our own efforts. The deep well of divinity is already present within us, “more intimate to me than I am to myself.”[ii] We don’t have to go somewhere else to find it. Lent is a time to tune in, go deep, and pay heightened attention to the Presence we often miss. At the same time, our awareness of – and relationship with – this Presence may be hindered or obstructed by any number of things, requiring some real digging on our part. The trouble is, that digging can quickly become a self-improvement project, with Lent’s success judged by the quality and success of our efforts. We imagine a more spiritually heroic self, and strive to make it come true. Thankfully, the extremists were not the norm. More prevalent was a spirit of deep humility about one’s capacities. John Climacus was a seventh-century monk at Mt. Sinai. 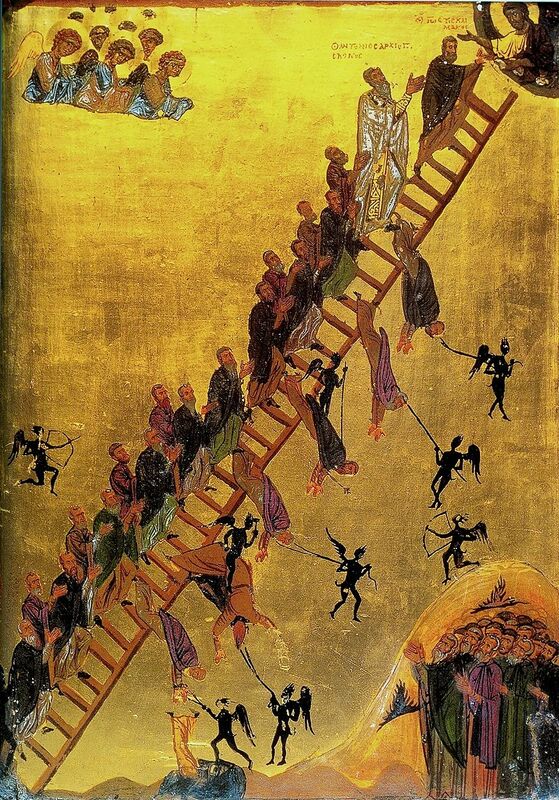 His image of the spiritual life as a “Ladder of Divine Ascent” was later pictured in a famous twelfth-century icon. So we don’t have to be heroes after all. What a relief! Humility, not heroism, is the way up the ladder. As the Rule of Saint Benedict teaches us, “by trying to climb we descend, and by humility we ascend.”[vi] That’s why Ash Wednesday strikes just the right note for the beginning of Lent. It brings us down to earth as creatures of ashes, dust and mud, undermining any pretensions of Promethean heroism. The Lenten journey is come-as-you-are. In the 1988 Winter Olympics, American speed skater Dan Jansen was favored in the 500 and 1000 meter events. On the morning of the 500 final, he learned his sister had just died from leukemia. His focus clearly elsewhere, he fell on the first turn of his race and never finished. He would also fall and fail in the 1000 meters. At the 1992 Olympics, he again failed to win the medals expected of him. The 1994 Oympics offered him one last chance, and he came to the line of the 500 meter race as the clear favorite, the only skater ever to break 36 seconds, which he had done four times. But after one slight slip on the ice, he finished out of the medals yet again. Ash Wednesday came just after that race, and I reflected on Jansen’s story in my homily. Although Jansen would finally win a gold medal a few days later (in the one race where he was an underdog), it was his “failures” that resonated with people. After the liturgy, a therapist in the congregation told me that many of her clients that week had talked with her about Jansen’s story, and how much it moved them. If the world’s greatest skater could fall, then maybe it was all right for them to fall as well. You don’t have to be a hero, only yourself, letting the soft animal of your body love what it loves. As Mary Gauthier sings so beautifully, we could all use a little mercy now. [ii] St. Augustine, Confessions III. Tomorrow is Candlemas, celebrating the presentation of the baby Jesus in the Jerusalem temple. In liturgical tradition it is the final feast day in the sequential narrative of Christ’s birth. A great procession of candles is its distinctive feature, but few churches observe this lovely ritual of light anymore. In the United States, the second day of February is better known for a groundhog and his shadow. The final verse will resonate with anyone who feels a little wistful when they take down the Christmas decorations. As former things grow old. You can hear Kate Rusby’s lovely rendition of the carol here. In a course I teach on “Jesus and the Movies,” one of the questions we consider is how both the divinity and the humanity of Jesus are represented cinematically. Is it something the actor shows with his face or his body language? Is it an action he performs, or the way he is lit, or a certain music cue played whenever his divinity comes to the fore? An affectionate conversation with his mother, a flash of irritation, or a playful water fight with his disciples at a village well show him as recognizably human. Miraculous power and a commanding presence suggest the divine, though it is often the lighting, the music, and the reactions of others – in other words, acts of interpretation rather than disinterested observation – which make this clear. The ecumenical councils of the early church struggled for centuries with how to avoid emphasizing either the humanity or the divinity of Jesus at the expense of the other. The fifth-century formulation of “fully human and fully divine” did not exactly settle the question. It continues to be a paradox – a “possible impossible” – which rightly resists comfortable appropriation. It is especially difficult when there is so little consensus about the nature of either humanity or divinity. God is largely unthinkable for secular culture, and the last hundred years have confused and darkened our understanding of humanity. How then can we even state the paradox when we have lost the language for both of its terms? From its very beginning, Christianity has had to wrestle with a disturbing question: If God is the power and the beauty and the glory, how can a disgraced, disfigured, and crucified human bear any resemblance to the divine? I like Reinhold Niebuhr’s approach. Instead of figuring out how to explain “Jesus is God,” better to say that “God is like Jesus.” Once God owns the vulnerability and the suffering of self-diffusing love, fully divine and fully human start to look much more alike. But what about the way Jesus shines in his Transfiguration? Doesn’t that indicate the presence of something utterly “other” at work in Jesus, transcending the strictly human? I have written elsewhere about the symbolic dimensions of this strange story. Whatever the facts behind the text, it seems to ring true both psychologically and spiritually. Even if, as the gospels tell us, the divinity of Jesus was always in him, not everyone saw it, and no one saw it all the time. St. Paul’s metaphor was inspired by the story of Moses descending the slopes of Mt. Sinai after being in God’s presence. As Exodus relates, “Moses did not know that the skin of his face shone because he had been talking with God.” (Exodus 34:29) I love this detail. Moses shone with God’s reflected light, but he didn’t know it. Yet it would be quite evident to his friends when he returned to them. Let your light so shine. Robert Bresson, the French film director, shunned professional actors. 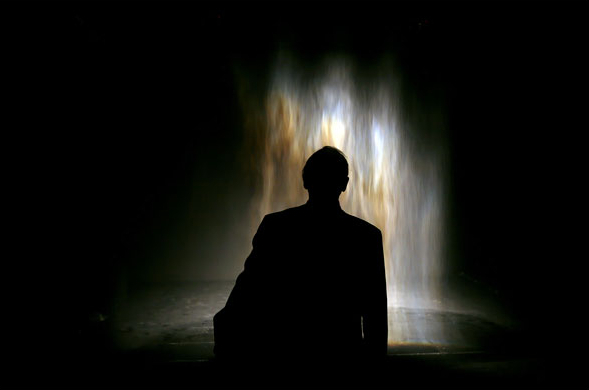 He hated what actors usually do in films, which is to explain their characters and link their actions to understandable motivations, thus denying the elusive mystery of being human, a mystery whose secret is ultimately beyond us. “The important thing, said Bresson, “is not what they show me, but what they hide from me, and above all what they do not know is in them.”[ii] Claude Laydu, the protagonist in Diary of a Country Priest, said that he did not realize he was playing a saint until he saw the finished film. 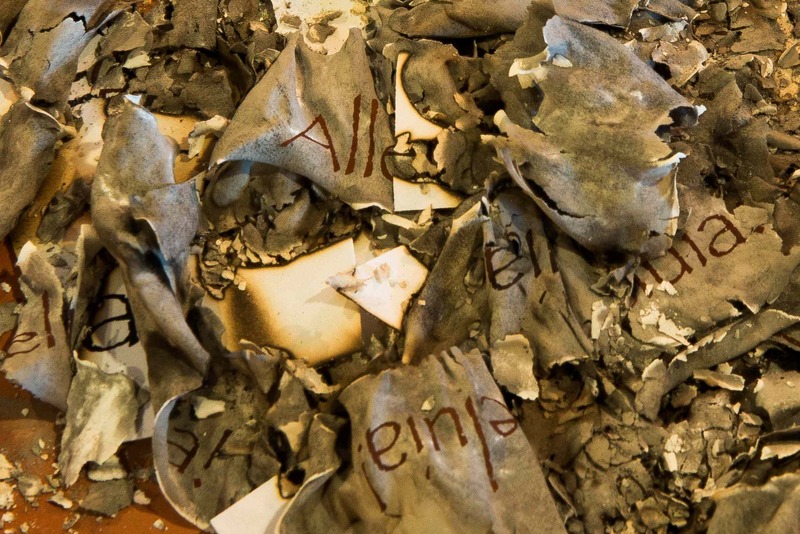 In nine days many of us will kneel to be anointed with ashes. We will be told to remember that we are dust. But after that we will undertake the long journey to Easter in the faith that our dust is mixed with a Light which we ourselves may not yet see or even know. [i] Although I can’t find the source for this quote, I believe it comes from Olivier Clement, an Orthodox theologian in France. [ii] Quoted in Keith Reader, Robert Bresson (Manchester and New York: Manchester University Press, 2000), p. 5, n. 12.